A fantastic article about Ann and Isidor Saslav (my in-laws) from the TylerPaper.com newspaper in East Texas. I will be attending the concert on March 31, 2012 at Stephen F. Austin College to honor, Isidor, and raise money for his chair at the college. OVERTON -- For Dr. Isidor and Ann Saslav, playing music is not just a hobby -- it's a way of life and a source of joy. Saslav, a professional violinist, serves as concertmaster for the Longview Symphony while Mrs. Saslav, a professional pianist, practices about two or three hours a day, preparing for performances. They have lived all over the world and studied with many outstanding musicians. Although the couple shares a passion for music, their career paths began under different circumstances. Born in Jerusalem and raised in Detroit, Saslav, 73, started studying violin when he was 7. Mrs. Saslav, 75, said her husband grew up in public schools and is "very beholden" to public schools. It was those public schools and scholarships he received in Detroit that afforded him opportunities, such as studying with violinist and concertmaster Mischa Mischakoff, she said. "Mischakoff took him on and as a teen, he put him to (such a) high standard that by age 17 he was a member of the Detroit Symphony Orchestra making a living at 17 playing the violin," she said, adding that her husband rode the bus to rehearsals and was able to help his family out financially. "We're so impassioned to help other poor kids get that start." Mrs. Saslav was born in Tyler and raised in Overton, where her mother always sang to her and her father played violin. "In my home all kinds of music were played," she said. "My father adored Dixieland and regular jazz, but he also listened to (Ludwig van) Beethoven and (Wolfgang Amadeus) Mozart, and I remember (composer Dmitri) Shostakovich when I was very young. "When she was about 3 years old or earlier, her father discovered she had absolute pitch, Mrs. Saslav said. From then on, she played piano and took lessons from a teacher in Overton, who had studied in Italy. She had her first piano recital at age 5 in Overton High School, along with other students. As a young girl, she said she knew Van Cliburn and learned she had Synesthesia, a neurogically based condition that causes her to hear in colors when she plays. "My father started me with a toy piano with eight notes on it when I was 2, (and) he had the idea to color the notes. He would write tunes for me in red, yellow, green on the right places on the staff. I think that's what started my Synesthesia off," she said. By age 15, Mrs. Saslav had studied in Dallas with a famous teacher from the University of North Texas as well as a noted concert pianist in New York, where she went to study, she said. She had also played with the Houston Symphony by age 15, and that helped launch her career.After winning a contest at age 15, she said she played clarinet and "was a normal kid except I practiced piano on a high level every day. "In my senior year (at Overton High School), they gave me half a year off because I had my credits and let me go home and practice," Mrs. Saslav said. "It was a flexible school system. "The Saslavs eventually crossed paths while working on advanced degrees at Indiana University. They discovered they knew a lot of the same people and were later married in the university's chapel. This March, they will celebrate 50 years of marriage. They have two children who live in California. Like their marriage, their careers have also blossomed throughout the years. Saslav became the concertmaster of and soloist with the Buffalo Philharmonic and the Minnesota, Baltimore, and New Zealand symphony orchestras as well as the Round Top Festival of Texas after studying with master teachers Mischakoff, Josef Gingold, and Ivan Galamian, according to his biography. He's also served as concertmaster of the Indiana University, Dallas, Kennedy Center (Washington, D.C.), Terrace Theater, and Baltimore opera orchestras as well as a member of the Detroit and Chautauqua symphonies, and the Orchestra of the Festival Casals in Puerto Rico. He has played several times at Carnegie Hall in New York and taught at Stephen F. Austin State University for 10 years. Mrs. Saslav has toured the United States as pianist of the Nova Arte Trio with violinist Arnold Steinhardt and cellist Robert Newkirk. She also received a Fulbright Scholarship to Vienna, Austria, where she attended the Akademie fuer Musik und darstellende Kunst, according to her biography. 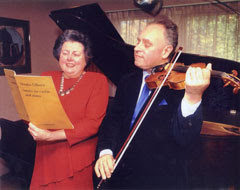 Among her former teachers are Menahem Pressler, Isabella Vengerova, Miecyslaw Horszowski, Grete Hinterhofer, and Silvio Scionti. The Saslavs have performed thousands of youth concerts and taught others. Saslav even had a famous student -- Boyd Tinsley, violinist for the Dave Matthews Band. "They're such intelligent people," said Jeannie Barber, executive vice president for the Overton-New London Chamber of Commerce. "You get lost in their conversations." Next up for Saslav is a concert at 7:30 p.m. March 31 at Stephen F. Austin State University, where a scholarship is being given in his name. Twenty-five performers are slated to participate. For Mrs. Saslav, it's a concert on Feb. 11, where she is playing a Mozart concerto with the Longview Symphony, with Tonu Kalam conducting. "When he (Kalam) was a boy, his father was a conductor, and he played the same concerto with his father conducting, so he knows this piece well as a pianist, but he said can't wait to do the other side," Mrs. Saslav said. Both musicians have advice for residents starting out. Mrs. Saslav encouraged pianists to practice at least 30 or 40 minutes each day and to warm up with scales and arpeggios. She also advised parents to give their child music because "it organizes the mind in a way only reading can do." Saslav's advice? "If public schools offer music -- take it." His wife agreed, saying "Grab any opportunity to study because it will enrich every day of your life. I can turn to any score and it lifts me up so high above the fray of the politics and the junk, and there it is. I have the most beautiful expression of mankind's creation." "Overton for me is just a wonderful place to live. It's quiet, there's not much traffic, and I can go anywhere I want to from here." Aside from music, she remains active in the local garden club and in school activities. She has also coached some children in band and tries to remain active in the Overton-New London Area Chamber of Commerce. When the Saslavs are not playing music, they enjoy reading and writing. Saslav also loved to drive to Canada each year for a George Bernard Shaw festival, and the couple even has a personal Shaw library in downtown Overton. Inside the library, an old medical building that Mrs. Saslav's father built in 1936, are pictures of friends, colleagues, great teachers, and conductors on the wall. There is also plenty of other memorabilia, including an old eye chart with pictures, which Mrs. Saslav's father used with children. Additionally, there is a kitchen and bedrooms where visiting scholars can stay and a keyboard. As Saslav holds his violin in the library on Thursday, he is asked what he enjoys most about playing. He responds by saying, "What do you enjoy most about breathing?" Hooray for music and Saslavs!